Vitamin D activation is necessary for the stored form of vitamin D to become available to the body. Did you know that the vitamin D within you is stored in its inactive form. Until it is activated, it cannot be properly utilized. This means you could have plenty of vitamin D in its inactivated form but unless you have good reserves of a certain nutrient, the vitamin will stay inactivated and unavailable. You may think that you’ve had plenty of sunshine, eaten plenty of vitamin D rich foods and must be replete. If your doctor tests you for vitamin D deficiency your levels will show good because the test picks up on the inactive form. What is that activating nutrient? It is magnesium. Sufficient levels of magnesium are necessary for the metabolization of Vitamin D from the inactive to the active form. If your magnesium levels are low, your vitamin D will not be useful. What’s more it could prove to be unsafe. 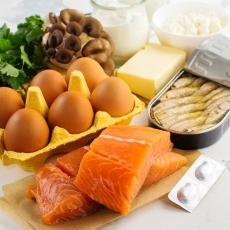 Taking an excess of vitamin D through supplementation can increase your calcium and phosphate. But supplementation doesn’t equal vitamin D activation. It can even cause problems with vascular calcification which occur when magnesium levels are too low. By the way, vitamin D is not a vitamin, it’s a hormone! Magnesium is required in 8 vital steps to metabolize vitamin D and this information is not known by many medics. If vitamin D is prescribed by your doctor he should also be advising that you take a magnesium supplement with it. This, sadly, is not always the case but it is something every doctor should know and act upon. A new study published in The Journal of the American Osteopathic Association found that low magnesium levels make vitamin D ineffective. “People are taking Vitamin D supplements but don’t realize how it gets metabolized. Without magnesium, Vitamin D is not really useful or safe,” says study co-author Mohammed S. Razzaque, MBBS, PhD, a professor of pathology at Lake Erie College of Osteopathic Medicine. With good Mg levels, less vitamin D needed. 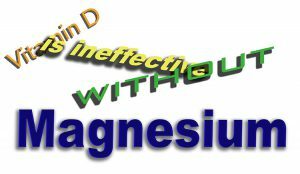 Patients with good magnesium levels required less vitamin D supplementation to achieve good vitamin D levels. Magnesium is also known to reduce osteoporosis and protect against bone fractures that can be caused by low levels of vitamin D.
It is likely that magnesium intake alone or its interaction with vitamin D, may contribute to vitamin D status. We already know that low vitamin D does increase the risk of disease and mortality and that magnesium is vital in the role of vitamin D metabolism. Researchers in 2015 investigated the idea that there was an association between magnesium levels and a modification of serum 25(OH)D3 concentrations associated with mortality of middle aged and older men. 1892 men aged between 42 and 60 were studied. They had no known cardiovascular disease or cancer. The conclusion was that those with low serum 25(OH)D3 concentrations had an increased risk of death if they also had lower magnesium levels. So the caveat for those wishing to up their levels of stored vitamin D by way of supplemenation – Don’t forget the magnesium. Vitamin D activation is necessary for the stored form of vitamin D to become available to the body. But that activation needs a certain mineral otherwise your vitamin D will be rendered useless. Vitamin D is a one of the most important out of all the Vitamin groups. We need it to stay alive, but more importantly, it gives us energy, keeps us alert, and gets us going through our day. I am very happy that you decided to make this website, and have great content to go over as well. Thank you for all your hard work.